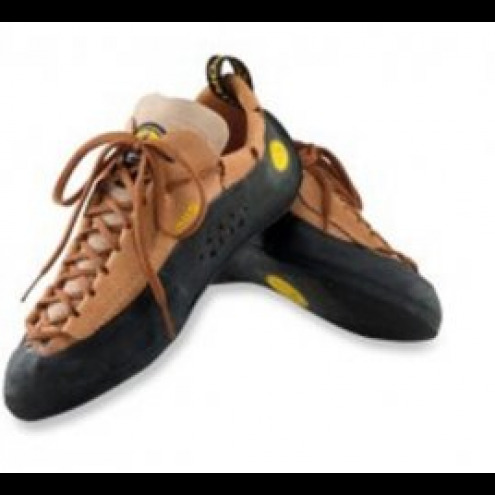 One of the most popular climbing shoes around, the venerable La Sportiva Mythos rock shoes are adored by both beginners and pros. Patented Mythos lacing system fine-tunes the fit to the shape of your feet for the perfect feel whether youre on a long multipitch climb or at the gym for a quick workout. Soft unlined leather uppers stretch and mold to the contours of your feet, offering a snug form fit for excellent performance. Great for crack climbing, the low toe profile lets you slot your feet in thin splitters. 4mm Vibram XS Grip outsoles stick well whether youre smearing or climbing cracks rands are perforated to allow for stretch and comfort.